Playa Mizata is the ideal starting point for surfing. 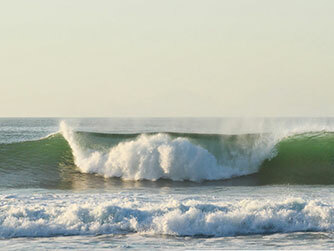 It is also one of the most private where you can completely dedicate to surf. Furthermore, this beach offers a friendly camping esplanade. Playa Mizata is attracting more and more surfers, not only because of the break, silence and tranquility that comes with it. The surf is very consistent, the point break is the best known of the breaks, but there is also a beach break and a reef break. The water is clean and warm and best of all, most of the time you will have the waves to yourself, unlike Playa Sunzal and Playa Tunco. For peace of mind and security you can be accompanied by the National Tourism Police (POLITUR) at no cost. Simply request this service one week in advance. Be sure to consult the procedure. Mizata is a remote beach with some dining available in simple houses and there are small shops offering everything from soft drinks, sweets and other foods at low cost. By car: Mizata is after the fourth tunnel, clearly marked, following the Coastal road from La Libertad. By bus: Take Route 287 which has its way from the city of La Libertad to Sonsonate.